Apple CEO Tim Cook couldn't have described a more different iPhone X launch scenario for Friday vs what we experienced at September's iPhone 8 launch. During Apple's earnings call filled with glowing news, he noted that hundreds of people were waiting in line for the iPhone X at 8am local time in Australia, the first country where the phone went on sale. "I'm told we had several hundred people waiting at the store in Sydney," Cook noted. And it's a scene, he said, that's playing out throughout the world today, as Apple's cascading morning launch time follows the rotation of the Earth. The US, and specifically Apple's home of California, is always the last to receive new iPhone shipments. But given the almost instantly sold out iPhone X US pre-orders, we expect the crowds to follow suit. That contrasts with the lack of a similarly excited crowd waiting for the iPhone 8 and iPhone 8 Plus on September 22. The response was tepid, to say the least. The working theory has been that everyone is waiting for the iPhone X.
Cook painted a very different picture of two new iPhone launches again when he explained that Apple is effortlessly trying to meet the demand of iPhone X orders. "We're really happy that we're able to increase week-by-week what we're outputting and we're going to get as many of them as possible to the customers as soon as possible. I can't predict, at this point, when that balance will happen." That "as soon as possible" language, for some pre-ordering customers in the US and UK, has meant shipments arriving as late as December 22. iPhone X sold out for the November 3 launch day in just a few minutes. The iPhone 8 and 8 Plus, on the other hand? It's readily available a month-and-a-half after the two smartphones initially launched. In fact, you could have gotten either smartphone as a walk-in at some Apple stores on day one. The iPhone 5S and iPhone 5C all over again? Cook blames iPhone X supply constraints on Apple's ability to make such a good new iPhone. You gotta to hate when that happens, right? "The ramp for the iPhone X is going well," he said, "especially considering that the iPhone X is the most advanced iPhone we've ever created and it has lots of new technologies in it." 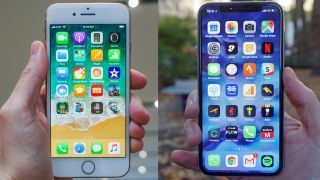 With reports of launch lines wrapping around the block and very positive initial impressions, the iPhone X vs iPhone 8 comparison may be another smash hit iPhone 5S vs the forgettable iPhone 5C situation all over again. Fun fact, back in 2013, iPhone 5S debuted the Touch ID fingerprint sensor, which the iPhone X does away with for the first time. It too was extremely difficult to get on launch day, especially in the new gold finish, as there were no pre-orders. Apple allowed for iPhone 5C pre-orders, kept the old passcode unlock system (just like the iPhone 8 keeps the old Touch ID biometrics) and you definitely didn't need to order it in advance to get it on launch day.